Rue, alongside Carnivora members Tore Moren and bassist Bjarne Torud, in association with erstwhile Street Legal drummer Bjorn Olav Bol Ladval and ex-Circus Maximus keyboard player Espen Stor? also operate the Ozzy Osbourne tribute band Ozzmosis. Signing to the Facefront label the group adopted the revised title and introduced new members guitar player Jorn Viggo Lofstad of Cry Free and Trivial Act bass player Steinar Krokmo. Following recording of the debut 'Infinity Divine' album, produced by none other than TNT guitarist Ronni Le Tekro, the band also incorporated keyboard player Ronny Tegner. Stian Kristoffersen, re-billed as 'Mr. Thunderforce', featured on the debut 'Reaping The Worldwinds' album from Electro Metal act Dimension F3H led by Limbonic Art mentor Morfeus (a.k.a. Krister Dreyer). He would be joined by his colleague Steinar Krokmo on bass for live work with this unit. PAGAN'S MIND signed to the German based Symphonic Metal specialist Limb Music Products for the Fredrik Nordstrom produced 2002 album 'Celestial Entrance'. Both guitarist J?rn Viggo Lofstad, and drummer Stian Kristoffersen featured as session musicians on Masterplan lead vocalist Jorn Lande's 2003 solo album 'Out To Every Nation'. Kristoffersen also made his mark on the 'Burning Earth' album delivered in November that same year by the joint Greek / US act Firewind. That December singer Nils K. Rue, bassist Steinar Krokmo and keyboard player Ronny Tegner would aid the Drover brothers, guitarist Glen and drummer Shawn, from Canadian Prog-Metal band Eidolon, in the studio with their 'Dimension Infinte' album. Nils K. Rue of donated his skills as guest singer to the track 'State Of Fear And Hate' on the 2004 Carnivora debut 'Judas'. During 2004 Stian Kristoffersen formed up a new band unit fronted by ex-Firewind and KenZiner frontman Stephen Fredrick. Working with producer DAVID T. CHASTAIN the band also included Vainglory guitarist Corbin King and bassist James Martin of Zanister. That same year Limb Music Products would re-issue the debut PAGAN'S MIND album 'Infinity Divine', adding a new recording of the track 'Embracing Fear', as well as a cover version of King Diamond's 'At The Graves'. This latter song featured guest appearances from Glen Drover of Eidolon, Megadeth and King Diamond and Gus G. from Mystic Prophecy, Firewind and Dream Evil. 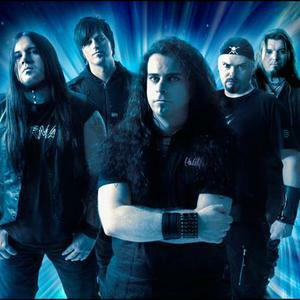 The PAGAN'S MIND May 2005 album, 'Enigmatic: Calling', debuted at no. 15 on the national Norwegian album charts. J?rn Viggo Lofstad would work with Jorn Lande once again, sessioning on his album 'The Duke'. It emerged in late 2005 that both guitarist J?rn Voggo Lofstad and bass player Steinar Krokmo had engaged with Beautiful Sin, a project assembled by the Helloween, Gamma Ray and Masterplan credited drummer Uli Kusch and also featuring Belgian female singer Magali Luyten plus Masterplan keyboard player Axel Mackenrott. This act issued 'The Unexpected' album in May 2006. PAGAN'S MIND toured the UK in March 2006 in collaboration with Power Quest. In December it was revealed that Nils K. Rue had teamed up with King Diamond guitarist Andy La Rocque, Tin Machine guitarist Reeves Gabrels and Hammerfall bassist Magnus Ros?n in a new new project called X-World/5. Drums were handled by the mysterious 'Big Swede'. A reissue of Infinity Divine was released in 2004.